Brrr....it's the middle of winter and whilst we don't technically get too chilly here in the North, it's still cold enough to light a fire. If you are in the northern hemisphere, curling up by a fire with a book right now is probably the last thing you want. But here winter is making herself at home, and one of my favourite things to do in winter is to read. 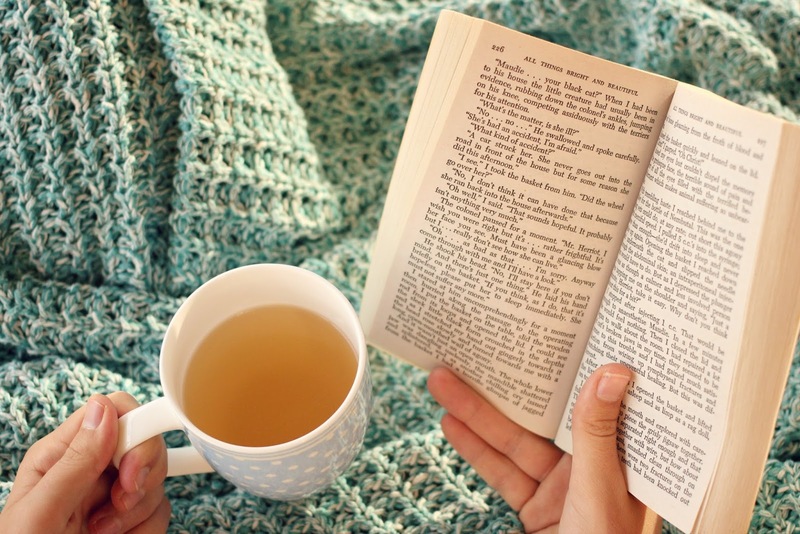 There's something so comforting about snuggling under a blanket with a book and getting lost in the world you have entered. I'm always looking for new novels to read, it can be so hard finding decent literature, and I thought that no doubt you love to discover new books too. Here are 3 books to read by the fire this winter. James Herriot is one of my favourite authors. His ability to capture characters and tell stories is so engaging, I have a lot of trouble putting this book down. All Creatures Great and Small is the first in a series of novels he wrote about the people and animals he met when working as a newly qualified vet in the Yorkshire Dales in the 1930's. This book will literally make you laugh and cry, and is really a must read. This book is of course where the inspiration for my Border Collie Rilla's name came from, although she wasn't exactly named after the character herself. It's the most grown up novel out of the Anne of Green Gables series and my favourite. The story is entwined with WWI, which lends itself perfectly to fireside reading, and is filled with both humour and more serious notes. This is the true story of Adeline Yen Mah, growing up as the unwanted daughter in a wealthy Chinese family in the 1940's. The name 'Cinderella" was what caught my eye as a child, however it is both a heartwarming and heart wrenching tale, and has remained a life-long favourite. Whilst this book will certainly take you through a range of emotions and produce a few tears, you will love following the remarkable story of little Adeline, as she overcomes her hardships against all odds, and realises her dreams. Now, I'd love to know if you have any favourite books to read by the fire? Hope these are some you haven't read and enjoy as much as I do. Oh Sarah! You have made me want to read the 'Anne' books again. I love them all. Winter Solstice by Rosamund Pilcher is a favorite of mine. Dinner at Rose's by Danielle Hawkins would have to be one of my favourite contemporary novels. You laugh, cry and are completely engrossed from start to finish. I also LOVED the James Herriott books. My Dad had all of them and I used to read them (and the Billabong Books by Mary Grant Bruce) after 'lights out' under the blankets with my torch. Oh ... the memories :) I enjoyed the Guernsey Literary etc.too and always devour anything written by my friend, Monica McInerney. Have you read Danielle Hawkin's other book, Chocolate Cake for Breakfast. I loved that too. Merci pour ces bonnes idées, et dans les commentaires il y a des bonnes idées, à moi de les trouver dans la traduction française mais merci à toutes pour les conseils lecture. Vous êtes les bienvenus Mam ! J'aime aussi la lecture en plein milieu de l'été , quand il fait trop chaud pour faire à peu près rien d'autre! You are most welcome Mam! I also love reading in the very middle of summer, when it is too hot to do almost anything else! i haven't read the Herriott books in decades. thanks for the reminder. they are on my library book list. did you knit the blanket in this picture? i just loooooove it! :) I have well-worn copies of all of the books in the Anne series from when I was a little girl, and remember visiting Green Gables on a family trip when I was around 10ish - I was very excited...my brothers not so much! I haven't read the other two, but they do sound enticing. It's tourist madness in an otherwise beautiful little island. :) https://www.tourismpei.com/green-gables-house A gorgeous part of the world to explore if you ever make it up that way.